The Outdoor Research Men’s Alti Gloves are a high end, expedition glove designed to be worn in the most extreme weather around. At a glance the Alti Gloves are very high quality and very well made. They come in two colors, black and my favorite, charcoal/natural which look fairly stylish but more importantly they look very professional and practical. After all this is a high end glove so fashion is unlikely to be a key consideration. The only initial concern is the price. The Alti Gloves from Outdoor Research are a fairly costly glove but are they good value for money still? The Alti gloves are incredibly comfortable to wear. The gloves are made from 90% Nylon and the remainder is Spandex making the glove slightly stretchy which ensures a tight yet comfortable fit. The only real downfall when it comes to comfort is for me the gloves came up slightly small and so I would advice anyone purchasing them to perhaps get one size larger than they normally would. The gloves also feature an elasticated section on the cuff as well as a wrist strap to ensure that the glove is fixed firmly in place at the wrist. It’s fairly uncommon to have a combination of an elastic cuff as well as a strap but for me it works. No nasty cold winds or airs can enter the gloves. In addition to this the inner lining of the Alti gloves has a nice feel to it and overall once you have the right size for you the Outdoor Research Alti Gloves are really comfortable. These gloves were made for warmth. The Alti Gloves appear to be a development of previous gloves manufactured by Outdoor Research as they claim the gloves now contain more Primaloft hi loft insulation – the best alternative to down. As well as now the liner contains Primaloft active which enhances the glove’s moisture management. The combination of these two additions is simply perfect. The additional insulation in the shell of the glove means that they are incredibly warm but they can never be too warm. Thanks to the Primaloft active in the liner any moisture build up is swiftly wicked away and so your hands will always remain dry and at a comfortable temperature. Following on from their fantastic performance on warmth the Outdoor Research Alti Gloves didn’t let me down on water resistance. The waterproof properties of the gloves are second to none. 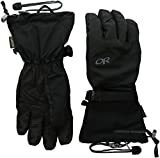 I wore mine in torrential rain and my hands remained both dry and comfortable due to properties previously mentioned. In addition to this the waterproofing doesn’t cause the gloves to become too warm as they are highly breathable, although this is probably to be expected of a glove in the same price bracket as the Alti Gloves. A highly waterproof, highly breathable glove. The Outdoor Research Alti Gloves just keep on giving. A key feature of the glove is the Alpen grip on the palm of the glove. One thing that particularly impresses me is how grippy the gloves are without having an ugly obvious grip slapped on to the palm. The grip is so good that I saw online that many people use the Alti Gloves as an alternative to ski gloves. Given their all round comfort, warmth and grip I can completely understand how these gloves would be perfect for skiing and to be quite honest just about anything. The Outdoor Research Alti Gloves are a very versatile glove that could be used in a very wide range of situations. There’s no point in sugar coating it, the Outdoor Research Alti Gloves are an expensive pair of gloves. But they’re worth it. Don’t get me wrong if you can’t afford to spend too much on gloves then there’s certainly better value for money options out there for you. But if you’re looking for something that can compete with the best of the best and don’t mind taking a small chunk out of your wallet then these may just be the gloves for you. Other than the fairly easy to solve issue of inaccurate sizing the gloves are almost flawless. You could debate that sometimes they may be too warm in more mild temperatures but that’s not what they’re designed for. To find any real faults in the gloves you have to be really really picky. If you’re looking for one of the best pairs of gloves around and you’re willing to pay the price then look no further than the these gloves. Thanks for stopping by and I hope you enjoyed my Outdoor Research Alti Gloves review.